And it comes with the leather bucket seat and onboard torture chamber options. 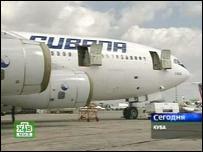 With a some bank from an old friend Castro a new presidential dictatorial jet has finally come through. Mercifully selected was the jet manufacturer with the worst crash record out there. Armored against WHO, I wonder. El Jefe himself, or it it just the CIA dementia drugs talking? At the moment it's being used for the rendition of workers to and from Caracas who happen to be prisoners of a detention camp on the well managed island of Cuba – called Cuba. At the State of the Black Union Tavis Smiley stated that it is designed to highlight what the Presidents do not highlight in their State of the Union. Tavis Smiley has mentioned this a couple of times. He said that "up in there", the president did not mention hurricane Katrina. The following wasn't sufficient for Tavis. The message by the president for bringing greater opportunity to the people of New Orleans due to the failure of government and local groups in lifting people out of poverty so that they can help themselves was not enough. Maybe he didn't watch the president's SOU. I doubt it.